On a tight budget? Wired gaming headsets cost less than their wireless compatriots and offer a lot more features. Personally I prefer wired gaming headsets for their clarity and responsivity. A good wired gaming headset can improve your overall gaming experience by tenfold. Steelseries does not like pimping out its products. It believes in subtlety and allows the quality to speak for itself. The Steelseries Arctis reinforces these ideas in its hauntingly flawless sound quality and luxurious comfort. Appearance wise, there are way cooler headsets in the market, but when it comes to sound quality, this is the best wired gaming headset. As expected with a Corsair mouse, it allows full customization as well thanks to the Corsair Utility Engine (CUE). You can customize the mouse’s pointer speed and polling rate, and personalize the 6 buttons’ function and the RGB lighting as well (located on the logo). The Harpoon has a 20 million click lifespan which delivers longevity in spades as well. It’s definitely something you should check out if you are looking for a perfect balance between performance and price. Impressive treble and bass quality. Looks pretty professional and yet gamer centric. 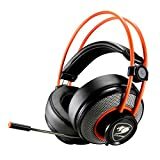 Virtual 7.1 surround sound functionality with Steelseries engine software. Don’t particularly like the ugly suspension headband. The GSP 350 from Sennheiser packs in 7.1 Dolby surround sound technology seen in its flagship PC 373D model, and together with the closed ear cup design, it provides a holistic aural experience. We felt the earcups were perfectly designed for long hours of gaming and the sizing is ideal for all ear types. By the way, the right earcup has all the controls on it, which is the way we like things. This headset relies on an adjustable split headband with a closed back design and a noise cancelling mic that mutes the moment you lift it up. It also detects and nullifies breathing sounds, so your fellow gamers will appreciate your voice clarity in the background. 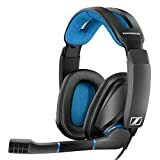 The GSP 350 is a lite edition from Sennheiser that does not cost as much as its other flagship models and yet provides a good gaming experience. If you can’t spend big bucks on say, a PC 373D, try this instead – you won’t be disappointed. Proper Dobly 7.1 Surround Sound without the accompanying costs. Memory foam earpads are pretty comfortable even on larger ears. The Dolby feature works only with PCs, can’t use them with gaming consoles. 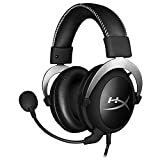 The most affordable wired gaming headset in our list, the HyperX Cloud Pro is the choice of several eSports players just starting out. Yes, it is cheaper, but that doesn’t mean it isn’t quality. Though the design does not speak much to its pedigree, the HyperX Cloud Pro’s plastic material does leave us feeling a bit let down. Nevertheless, the moment we listen to the 50mm directional drivers, we find ourselves in a forgiving mood Superb stereo coupled with the noise cancelling mic, together makes for an immersive session of headset gaming. The volume controls on this headset are positioned on the earcups directly. Now to some, this might seem like an odd choice, but after a couple of days, we felt this decision to place the controls closer to your ears ergonomic. We no longer had to fiddle with the wire to find the controls. Besides, the controls don’t add weight to the headset as we were able to wear them for hours without feeling fatigue. For those on a budget, these are some pretty good cans, to begin with. Pretty lightweight for a gaming headset. For an affordable gaming headset, it boasts excellent ergonomics. Memory foam cups are comfortable even after hours of gaming. The microphone does not come off and can be a bother if you don’t use it much. We weren’t particularly excited on the bass. It was only a matter of time that specially designed audio headsets with virtual reality capabilities made it into the mainstream gamers market. The Turtle Beach 350 Stealth VR is the cheapest VR capable headset for gaming with a lot of features. It is flexible thanks to the inclusion of several features, and yet the design accommodates all head sizes due to the sturdy headband that can go over the top of any VR headset. 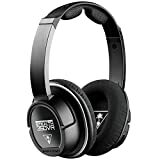 In other words, sizing and fit are assured with the Turtle Beach 350. The best wired gaming headset with VR features boasts only of a black and white color scheme. Naturally, it is designed for practicality rather than dramatic looks. You get mic monitoring that lets you check your voice, a bass boost to improve the bass response, grooves in the ear cups to help tuck the cables away and a noise cancelling mic that detaches for single gaming sessions. Though this headset is designed more for VR gamers, PC gamers too will love the features and its extremely comfortable fit. Comfortable around the ears, does feel constricting under heavy usage. With battery amplification, you get a fuller environment. Comes with mic monitoring if you need to adjust your voice. The design is flimsier than competing expensive headsets. This particular mode lacks surround sound. Up until we tried the Cougar Immersa, we though the HyperX Cloud Stinger was the cheapest immersive headset on the market. However, the Cougar Immersa has just become our best wired gaming headset in under $50 category. Yes, this gaming headset costs less than all other wired headsets we have tried thus far and yet somehow manages to sound bold, bright and big in just the right amounts. Its design isn’t something that everyone will appreciate, but its functionality is undeniable. The super massive earcups are just awesome as they fit on your ears entirely without putting any additional pressure on your head. Worn for long periods, you won’t feel a pinch. As for the sound balance, the bass and mid-range tones are bright though the treble is a bit lacking. The mic on this headset is retractable so online gamers should not have a problem hearing what you say when you want to. Just remember to manually mute the headset when you don’t want your fellow players to listen in on you as this does not have an auto mute functionality. Plenty of bass to blow your mind. Large comfortable ear cups that just hide your ears away. The headband is a tad bit flimsy, which is disappointing considering Sennheiser makes good quality products. How We Narrowed Down The Search? Audio quality is subjective. Two headphones do not sound the same, and neither will two individuals perceive audio alike. Naturally, our tests are highly subjective to the setup we use. Hence, to produce the same results across the range of test headphones, we opted for two test rigs. One is a decked up PC running an MSI Z97 motherboard with onboard audio amplifiers, and the other is a Dell Inspiron 7559 that we plugged into a Sound Blaster E5 high-resolution USB DAC. Just in case we need amplification, we opted for a portable FiiO headphone amplifier for the laptop setup. Before narrowing down our search, we read through online reviews on gaming headsets, and from our experience, we knew that the topic of the best wired gaming headset would be contentious at best. Every single headphone had reviews in the one-star category proclaiming it to be the worst possible device in the history of gaming. So naturally, we eliminated all one-star and two-star reviews and recalculated the average ratings of the top thirty wired gaming headsets on popular platforms such as Amazon. It was from those top thirty that we finally narrowed the search down to just 10. Of the ten that we narrowed down, we compared the features to the price and eliminated another three simply because they were too overpriced for what they were offering. The other two were dismissed on the grounds of being wired and wireless both. Naturally, these headsets would not be a fair competition to the rest as they were not exactly wired headphones. And finally, we had our top five picks that we then got through our partner sources for the sole purpose to review. Now, if you have read thus far, then you are commited to finding the best wired gaming headset. In that case, don’t just read our short reviews but also understand what it takes to find the best wired gaming headset. Our buying guide can serve as a standalone tutorial for anyone buying a wired headset or in tandem with the headphones we have reviewed for you. Quite often folks decide on a headset in a matter of seconds (if they get an opportunity to test) but a few minutes is not sufficient to give you the full picture. With headsets, unlike any other gaming hardware, time is your best friend. The more you get to use the headset, the more you learn of its nuances and unique abilities. It is particularly the case for brand new headsets. A new headset much like any audio device will take the time to break-in. Drivers need time and use to open up and provide the full frequency range. Some headphones don’t sound too different after days of use, but there are brands and specific models that become better or worse as time wears on. As a rule of thumb burn in a new headset for at least 24 hours to get a good idea of its sound signature and aural impression. Hence, in our reviews, we spent hours on the same headset to get a feel for the change in sound signature. We did everything from playing games to music and even watching YouTube videos. Only after hours of burn in will a headphone show its true colors. We are not bothered with whether the microphone can record crisp broadcast quality sound or manage podcasts. Our sole concern was the clarity of the voice and the noise levels. For this, we played online as a team and gauged the interference, noise, and clarity of each headset. Remember, these are gaming headsets and an essential feature of any gaming headset is the clarity of the mic. Do not forget to check reviews on the clarity of the microphone when you look for the best wired gaming headset. Features such as noise reduction, automatic breath recognition, and auto-mute are all helpful. Unlike wireless headsets that operate on Bluetooth, wired headsets use jacks or ports. Typically you can find two connection types namely, 3.5mm jacks and USB ports. All surround sound headsets will require the use of a USB jack but not all come with an additional 3.5mm port. If you plan on using your wired headsets with mobile devices, gaming consoles and more, remember to have a 3.5mm port or buy an adapter. Sound quality is paramount, microphone clarity is important but what about comfort? Yes, a headset must be comfortable to wear for hours without feeling constricting or painful afterwards. Pay close attention to customer reviews on comfort, though they may be divided. Usually, those with largely padded earcups that encompass the entire ear are comfortable, but it also depends on the elasticity of the headband. Sound quality is a good thing to have in a gaming headset, but gaming performance is what you should demand. In fact, in all our reviews we concentrated mostly on the gaming performance but noted which headsets had a good movie or music capability. Read through reviews of any headset and 5% of the respondents would have criticized the product because of the price. Cost is a subjective matter but try and understand what features you should expect in each price range and decide accordingly. It isn’t just your budget that plays an important role but also the features mandatory in a particular price range. At the risk of sounding like a broken record, we say again – the best wired gaming headset is subjective. Your choice might be lightyears different from ours. Read our reviews and let it be a guide to choosing a good headset but do your own research, realize what you want and how much you are prepared to pay. You should consider buying a gaming headset only after you have done the needful research. Otherwise, pick one from our review list that seems best, and you are ready to go.